Apple cider vinegar has a multitude of uses around the homestead, and if you’re not making it yet, you’ll want to pay attention to this guide. Ok, so why homemade Apple Cider Vinegar? Making apple cider vinegar is so easy, and doesn’t take much effort, that it’s really one of those items you should produce at home. 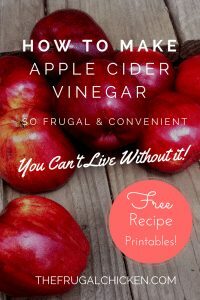 You can easily make a gallon of vinegar for less than those quart-size bottles you buy at the store (I personally don’t make that much at once, but I include it as an example of how frugal making your own cider is). I make apple cider vinegar with the leftover apple scraps when I make applesauce. Instead of throwing my cores and peels into the pot when making applesauce, I save them (no need to strain the applesauce later) and use them for apple cider vinegar. If you make a lot of pies, you can use the scraps from those apples, too. Apple scraps, honey (or other sweetener) and water is all you need to start making your own apple cider vinegar. It really is that simple. I start with the scraps from 6 lbs of Red Delicious apples. Some recipes suggest using sour apples, some suggest mixing sweet apples with tart apples, etc., but I’ve found it doesn’t really matter. Since I use scraps leftover from making applesauce, my vinegar is usually made with sweet apples. You want to use a sterilized mason jar (because what would home brewing be without a mason jar? 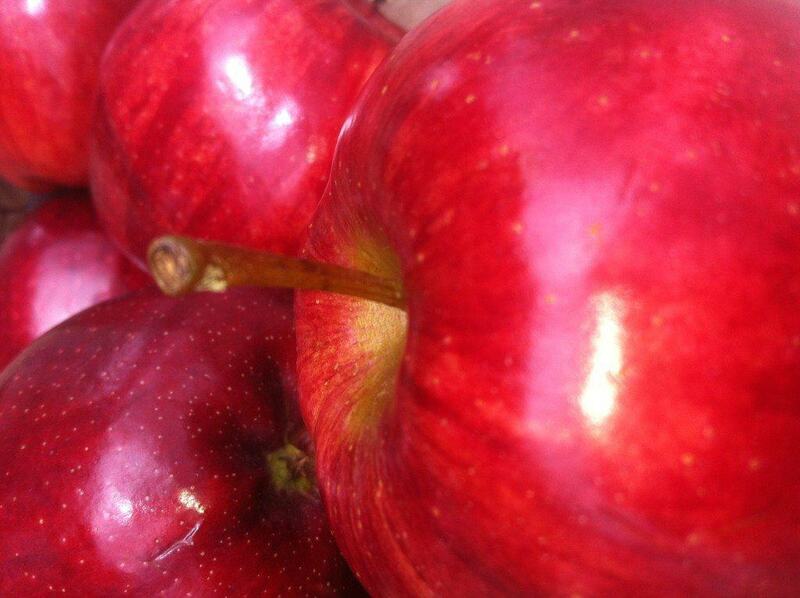 ), to make your apple cider vinegar to keep nasties away. There’s detailed directions here. Put your apple pieces in your mason jar, leaving a couple inches or so at the top of the jar. Mix your honey and water together, and pour over the apple scraps. The apple needs to be covered completely, and should stay submerged. Use a weight if necessary. Cover the opening of the mason jar with a cheese cloth (a brand new cloth diaper works also!) and tie with a rubber band or a string. The cheese cloth is super important – it keeps out contaminants. Let the mixture sit for two weeks. It will turn into apple cider as the apples ferment. If scum forms at the top – don’t worry! As long as the cider smells ok, the scum is harmless. Of course, if your mixture smells funny or moldy, throw it out and start over. 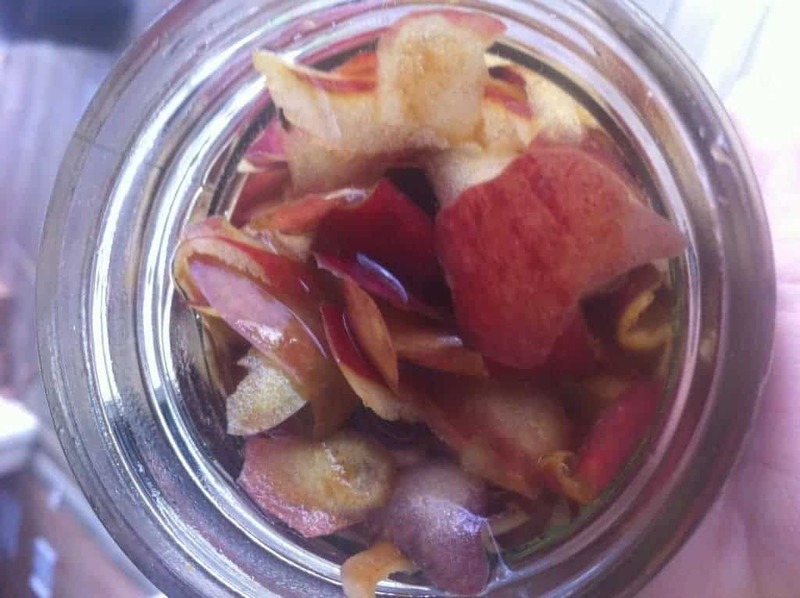 When the apples get to the fermentation stage, strain out the apple scraps, and return the liquid to the jar. Let it sit for another 4-6 weeks until it smells like vinegar. It’s unmistakable! If it doesn’t smell like vinegar yet, let it sit until it does. The longer it sits, the more sour it will get. Savings aside, making your own vinegar has several advantages, not the least of which is you’re finding a use for something (apple scraps) you’d otherwise throw away or compost. If it can be used around the house, why not? You’re getting pure, undiluted ACV, and if you use organic apples, it will also be organic. When you make it yourself, you know it’s origins, and that it’s the real deal, unfiltered and raw. If you’re going to be consuming it, you’ll want to know where your ACV came from, and that it’s pure ACV. Use it instead of regular vinegar in marinades to lend a different flavor. Like anything fermented, ACV contains natural enzymes and nutrients that nourish your body and reintroduces any lost nutrients. Consuming these goodies will lead to better heath. 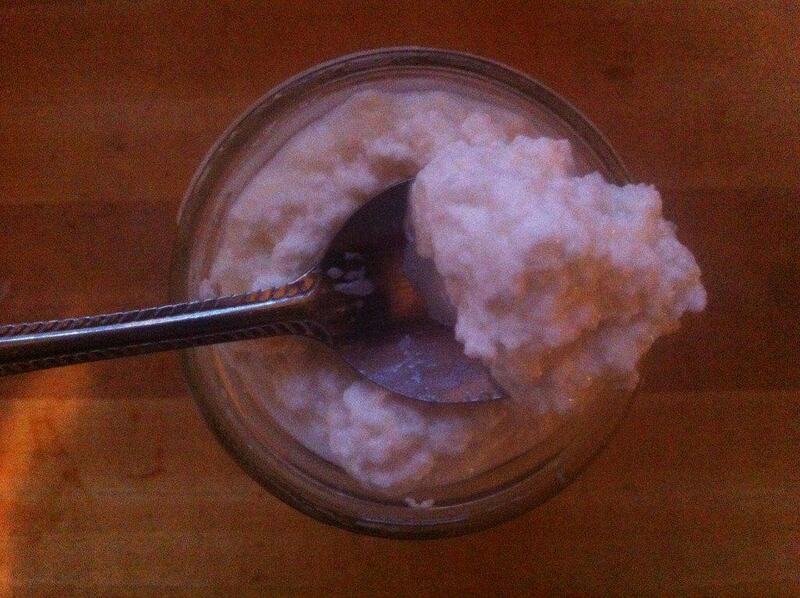 By combining 1/2 a gallon of milk (I used raw goat milk) with 1/4 cup of apple cider vinegar, you can make a sort of ricotta. It has a mild flavor, so it would work well with fruit, or in any recipe that uses ricotta or a softer cheese. 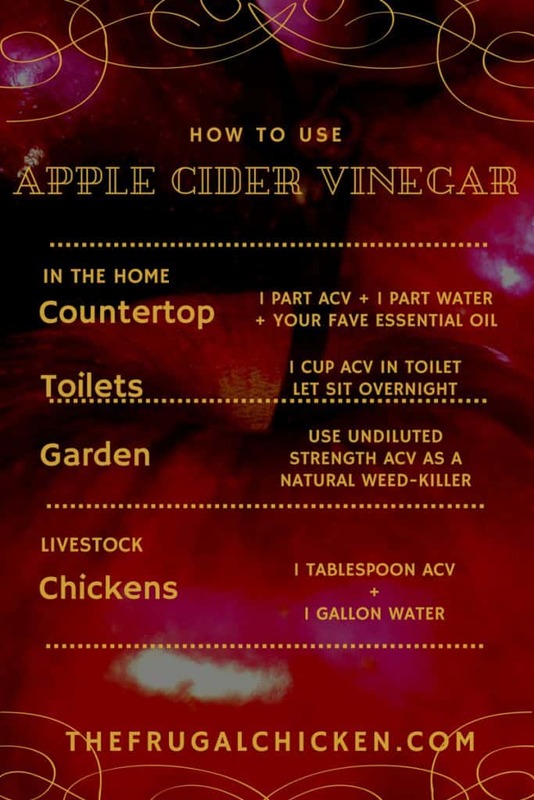 Because of the nutrients, ACV is great to add to your chickens’ water. It aids in digestion as well. It has antibiotic properties, which will not only deter nasties in their water, but in their bodies as well. I dilute 1 tablespoon with 1 gallon of water. ACV is also a popular homemade cleaner because of its antibiotic properties – there’s a printable at the end of this article with recipes to make your own household cleaners using ACV. Making your own apple cider is so easy, with so many uses, you’re just hankering to try it now, aren’t you? I use ACV all day long. Thanks for telling me how to do it myself, saves money and good for me! Thanks so much. This is a great idea. I use a ton of ACV. Glad to know how to make it. What size Mason jar are you using? Or is it a cup of honey for any size jar? Glad you like it! I use the 16 oz jars. I love ACV but won’t be making it at home – I’m way to messy and all over the place to be responsible for something that could go terribly wrong. I do love your uses for ACV though 🙂 That ricotta sounds yummy! I’m pretty messy too. I’m glad you like the article! Try the ricotta – it is yummy! I fancy giving this a go – can you freeze scraps until you have enough and do you add cores and pips as well as peelings? Hi Rosie, yes you can freeze the scraps and add cores. If you freeze them, though, I recommend adding one or two fresh peelings because the cold temps might have killed off the lactobacillus on the scraps. If you add some fresh peelings when you go to make the vinegar, that should make live good bacterias available to properly ferment the scraps. 🙂 I hope that helps! Does this end up with the “mother”? Hi Kerry, yes it does! Thanks for all the information on over ripe bananas. I was up on tips about banana peels and roses but your info is much more helpful. Can’t wait to tell my grandson about your website . Information about homemade apple cider and using apple cider is great.